For a long time, the right has argued that we shouldn’t worry about inequality because the true concern is the reduction of poverty. Conservatives also maintained that higher levels of inequality were unimportant because “a rising tide would lift all boats,” and high levels of inequality propelled the economy forward. New research by Branko Milanovic and Roy van der Weide decimates these myths. Milanovic and van der Weide find that inequality doesn’t fuel growth for the whole economy, but rather, just the rich. Once rampant inequality did become an increasingly mainstream concern, Martin Feldstein insisted that the question is “not inequality but poverty.” Economists believed that redistribution slowed down economic growth, and that attempts to reduce inequality would, as a result, only worsen poverty. The reasoning had at least two strands of thought: First, since the poor tend to consume most of their income, it was good for the rich to have more wealth to invest in the future -- inequality would increase savings. Second, inequality provided incentives for individuals to work harder to take home more of the pie. There is now a burgeoning literature showing that these assumptions aren't true, and that inequality actually reduces growth. That’s because the reasons for accepting inequality were actually backward. Instead of motivating the rich to invest, higher inequality meant that the poor took on more and more debt, destabilizing the economy. Without enough poor and middle-class families consuming their products, businesses had fewer customers, and less revenue. Further, instead of providing the poor and middle class an incentive to better their lives, higher inequality gave the rich a reason to pull up the ladder, leaving the poor behind. Instead of working harder, the rich sit back on their wealth. The poor and middle class, disenchanted by lack of opportunity, have less money to invest in their own education (and are therefore are increasingly burdened by debt). Inequality thereby reduces growth by reducing both demand and upward mobility. So Milanovic and van der Weide decided to investigate how inequality affects growth across the income spectrum. They used a state-level survey conducted once every decade to estimate annualized income growth at different income percentiles. What the researchers find is that the old story of "trickle down" economics have no support in the data -- instead, inequality boosts growth only for the rich. 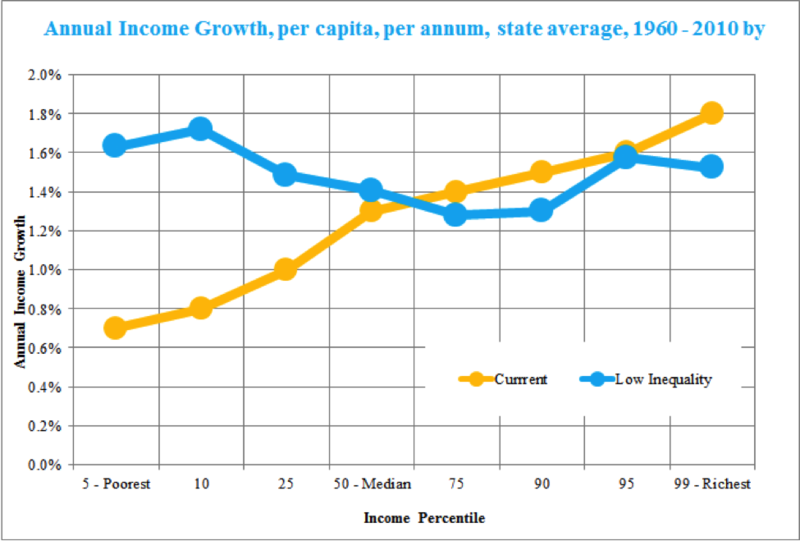 The charts below show income growth across different percentiles. Each line shows annualized growth over a decade with the horizontal axis defining growth by quintile. The first chart shows that during the relatively equal period of 1960 to 1970 (red), when inequality was lower, growth was strong and equally distributed (it actually slightly favored the poor). 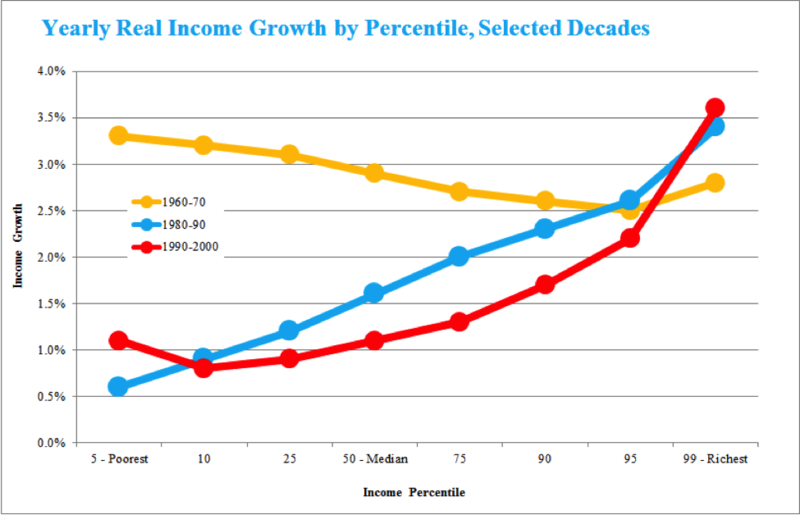 During the 1980-to-2000 period (blue and green) growth favored the rich; however, their gains weren’t enough to make up for the massive losses to the poor and middle class. Finally, in the period between 2000 and 2010, growth for everyone was abysmal in the wake of a massive financial crisis (see the purple line of the final chart). When the authors dug deeper and looked at individual states, they found that, “inequality is negatively associated… with subsequent real growth for the population located below the 25th percentile, and positively with growth for the population belonging to the top decile.” In simple language: Inequality benefits the rich and harms the poor. A rising tide doesn't lift all boats -- just the luxury yachts. Using the data the authors have developed, we can discover what growth would look like in a more equitable society. 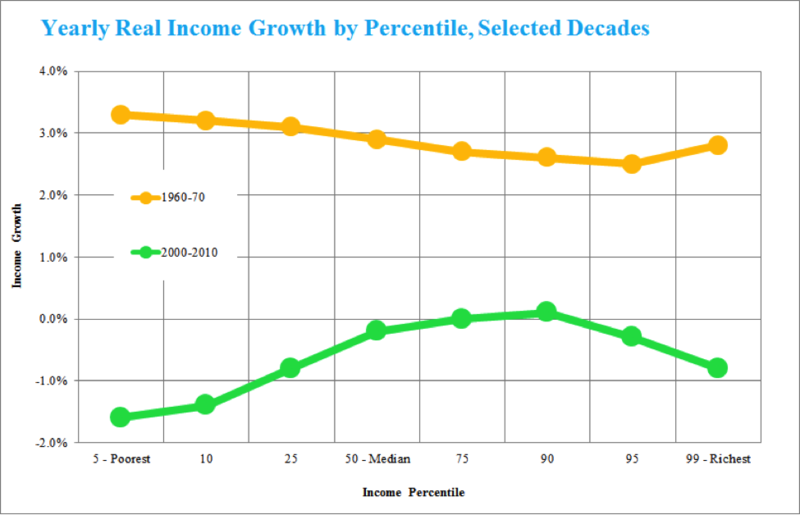 The chart below shows annual income growth between 1960 and 2010 by percentile in yellow. The chart is sloped upward, meaning that the income of the richest grew by 1.8 percent each year, while the growth of the poorest grew by .7 percent each year. However, if inequality was reduced by one standard deviation (the difference between Connecticut and South Carolina) across the country, income growth for the poor would more than double, to 1.6 percent each year. This has important political implications. First, we should not assume that the mere fact that inequality reduces economic growth will be enough to convince the rich to reduce it. Inequality benefits the rich immensely. Second, the idea that a rising tide lifts all boats has been so utterly disproved it should be embarrassing to state in public. Yet reformicons like Michael Strain continue to repeat the mantra, “Growth Beats Inequality.” That is false. Between 1960 and 2010, GDP increased by an annualized rate of 3.2 percent (a total of 378 percent) but incomes for the poorest 5 percent increased by only .7 percent a year. However, if we had reduced our gini coefficient (the standard measure of inequality) by only 9 percent, to the level of Japan, we could have doubled income growth for the poorest Americans. There is also hope, however. The growth rate of the 1960s to 1970s was rapid and equitable. Compared with growth rates from the massively unequal 1990-to-2010 period, everyone was better off. So there is some reason to believe the rich could support more equitable policies. But the rich won’t be so easy to persuade -- in a massively unequal society, even modest economic growth still benefits economic elites. Don’t worry about growth; worry about inequality.